Are You Taking Advantage of the Benefits Commodity Futures Hedging Can Bring to Your Business? Hedging with commodity futures can provide price protection to both producers and users of commodities. By utilizing commodity futures and commodity futures options to manage risk, hedgers can not only help minimize price fluctuation risk but may also, at times, gain a price advantage through positive returns from their commodity futures hedging. This hedging guide, compiled by the CME Group, the world’s largest futures exchange, is presented in easy to understand sections. The guide will first walk you through understanding what commodity futures and futures options contracts are and then will lead you into to how they can be used to help reduce risk in your business. 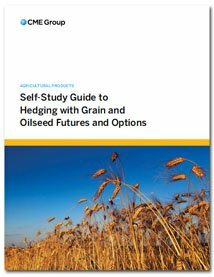 Although the guide focuses on the agricultural grain markets, it’s hedging principles can be applied to any commodity openly traded on any U.S. futures exchange. Additionally, the guide offers quizzes after each section designed to help you gauge your understanding of the futures markets and hedging information presented.